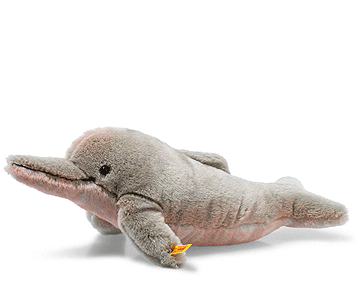 Protect Me Amazi Amazon River Dolphin is hand made in the finest grey & pink cuddly soft plush. The Protect Me Amazi Amazon river dolphin comes to your nursery right from the Amazon. This Amazon river dolphin is 35 cm long. His real-life counterpart is on the Red List for Threatened Species and is endangered. Even though his real-life counterparts are hunted for being fish eaters and competing with human fishermen, this dolphin is smiling with a mouth outlined in a brown tone. This freshwater dolphin believes there are people who will rescue him and his kind. He wants to tell people—both young and old—about how important it is to save the rain forest and protect bodies of water from environmental pollution. Amazi, the lovely Amazon river dolphin with a stomach featuring a grey and pink pattern, now spends his time swimming circles in the nursery. He is made from incredibly soft plush fabric. He'll swim right into your child's arms, where he loves to cuddle. Amazi is a cetacean and nestles against his new friend with his pink-coloured head. The enchanting Protect Me Amazi Amazon river dolphin brings a little bit of wildlife worth protecting right into your nursery.